Last week I took Gracie for her settling in session in preparation for her starting school nursery this September. As she has always been cared for at home by us and very rarely looked after by friends or family, I was quite nervous for her. She was very excited on the morning of the session. She woke up bright and early asking if it was time to go yet. I had to persuade her she didn't need to wear her uniform as that she could choose what to wear. She chose a Minnie Mouse dress top, black leggings and her denim jacket. She looked so grown up! We left Zach at home with his great Nanny and Grandad and walked to school. We were the first there but soon joined by lots of others to queue up outside the Nursery classroom. I started to feel bad when the other parents and children seemed to know each other from preschool whereas Gracie knew no-one. There was no need to worry. As soon as we were let in Gracie was off exploring. 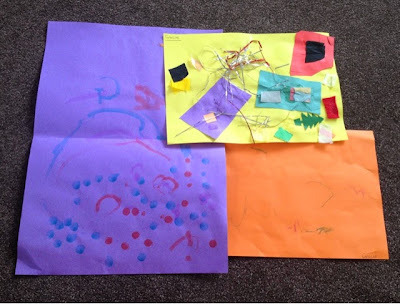 She started making pictures; painting, gluing & sticking and after a quick crayon picture she decided to head into the garden. The garden is lovely with lots of pretty plants and a huge selection of outdoor toys to play with. While Gracie was playing in the sand table I managed to have a chat with her TA. The TA had been watching her and talking to her and pointed out to me how confident she was with everyone around her. She was shocked when I told her that Gracie had never been in any form of childcare before. Whilst I was chatting, Gracie disappeared to go and explore the rest of the garden and play with some more toys it was lovely seeing her go and play independently as I was expecting her to stick close to me. I was also glad that there were so many lovely children in the class and the parents were friendly. The session was only one hour long and flew by, it even ended in tears as Gracie wanted to stay longer. The whole day proved to me that she is definitely ready to go in September. I just can't believe how quick the time has come around! Has anyone else got a little one starting school this September? Our little ones can be very surprising. I am very pleased that she settled in so well. I have 3 teenagers now, i remember their first day, i was very surprised at how fast they settled down, Gracie looks so grown up in the picture and by the sounds of it she settled very well.